Le Club Accorhotels has a new offer for Qatar Airways frequent fliers (officially – but this offer is really open for all). You can get 30% discount on participating properties in Middle East & Asia for stays between December 10 and January 16, 2013. You can access this offer page here . Hotels in the Middle East have breakfast and 1000 bonus Le Club Accorhotels points included in the rate. The offer is available in the following countries. 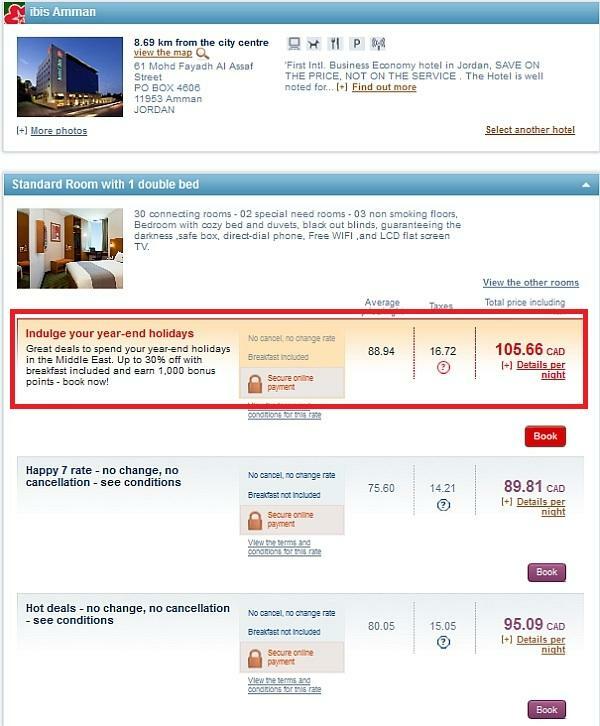 Here’s a rate example from Ibis hotel in Amman where the rate includes both the breakfast and the 1000 bonus points. The sale rate under this offer is not the lowest. You have to calculate if it makes sense to pay higher base rate for the extra points and the breakfast. You should consider this rate only if your plans are firm. Note that the breakfast and the bonus points are only included in the hotels within the Middle East. The discounted rate should be available in other locations as well.